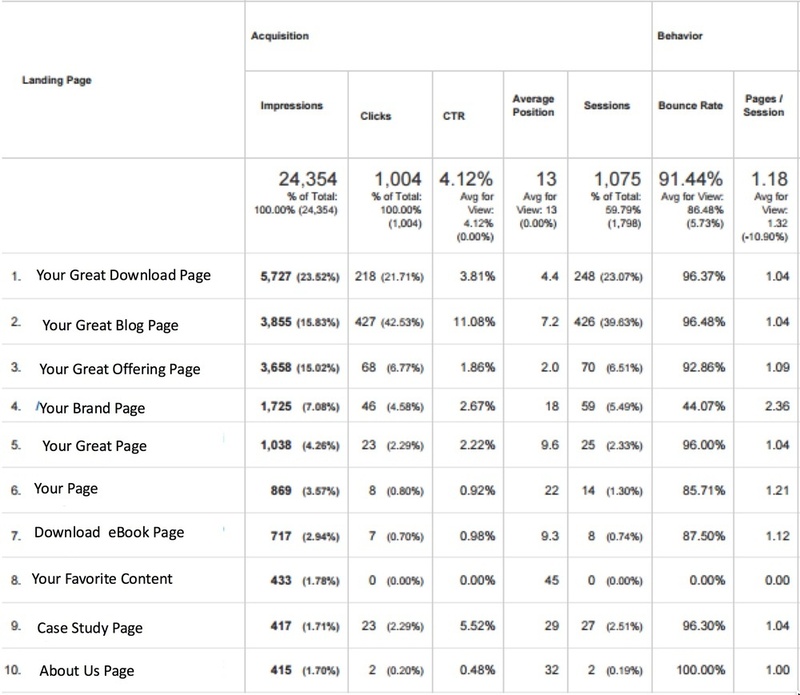 1 FREE tool in Google Analytics that every marketing manager should understand and use! In a perfect world you would know how many times your website pages appeared in searches and what words made you appear. While the world may not be perfect, you can know how many times you showed up in Google searches and what words got you there. There is a FREE tool in Google Analytics called Search Console. 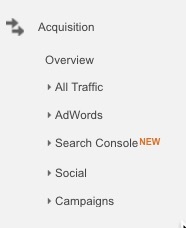 The graphic below shows how to locate Search Console in Google Analytics. Search Console does not automatically install with Google Analytics. Installation is easy and quick. 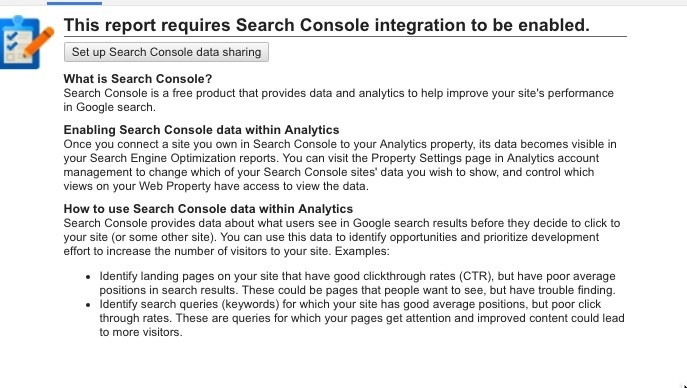 Simply click the Set up Search Console data sharing button and follow the directions. Once installed you will gather meaningful business intelligence about your website. Impressions - The number of times your website showed up in Google searches excluding AdWords. Clicks - How many times your website was clicked in search results excluding AdWords. Average Position - Where you showed up in search results on average. Smaller is better. A quick glance at the above chart allows you to know what resonated and what flopped. It may have flopped because your snippet description was bland or incomplete. Copy the Landing Page into Google search and see what description shows up. Time for a gut check. Would you click based on the description? If not, then it is time to improve your snippet descriptions. You can also look holistically at Search Queries by clicking Queries on the left hand menu. Great position without clicks should concern you. Copy the Search Query term and paste it into Google search. Look at the description. Gut check #2- Would you click based on description? Google Analytics Search Console eliminates the "think so" and provides real data about how you are positioned and perceived in internet searches. GREAT POSITION WITHOUT GREAT CONTENT(MEANINGFUL DESCRIPTORS) IS WORTHLESS! This really begs the conversation about Designing For Conversion. It is no longer enough to shove keywords into a box to generate traffic to your website. That method of SEO is not effective! It is about CONTENT and MEANINGFUL CONTENT that clearly articulates your offering to potential website visitors. By no means am I suggesting you completely redesign your website- see How Updating Your Website Can Destroy Your Brand. That being said, Search Console allows you to see what is working and what is not. Amplify your successes and fix your failures.